If Alix Magner thinks the strategies in LAUNCH are this important, might you find them helpful and inspiring too? Below, see the 5-star review Alix Magner gave LAUNCH on Amazon.com. If you’d like to locate a financial planner or wealth management advisor who’s read LAUNCH from cover-to-cover as Alix has, visit my Approved Consultants tab on this website. Did you know — if you wait until your son’s in 11th grade to start thinking about college, 75% of the best ideas for getting him through college debt-free will be gone? My book will still give you valuable help if you’re at that point right now, but to get the best possible running start, read the first four chapters of LAUNCH when your kid’s in middle school. Please tell your friends. If your child is already in college, LAUNCH may save you thousands between now and her college graduation. Here are four things you may not know. First, you need to be filling out the FAFSA form every October 1st that you will have a child in college the following fall. This is true even if you make $200,000 per year and are utterly convinced you will never get any help paying for college. College aid is handed out based on a wide variety of constantly shifting and interwoven factors, so if you neglect to fill out the FAFSA form, you may be leaving thousands of dollars on the table. Now, that said, wouldn’t you like to know what to do right before you fill out the FAFSA each October — to make sure you get all the free money you have coming to you? Chapter 20 of LAUNCH clearly explains this. Second, did you know that there are safe, legal strategies you can use while filling out the FAFSA form to help your child get extra free money for college next year? Wouldn’t you like to know what those strategies are well before this coming October 1st, so you can take full advantage of them? Chapter 22 of LAUNCH will explain them all to you. Third, did you know that you can approach your daughter’s college financial aid office and request additional help paying her college bills? The timing on this is important, though. Wouldn’t you like to know when to make this “appeal,” and what six things to say as you do so? Chapter 26 of LAUNCH explains exactly what you need to know. Besides all this — if your daughter doesn’t yet have a career goal in mind for after she graduates for college, you should race straight to chapter 13 of LAUNCH right now. This week. Why? 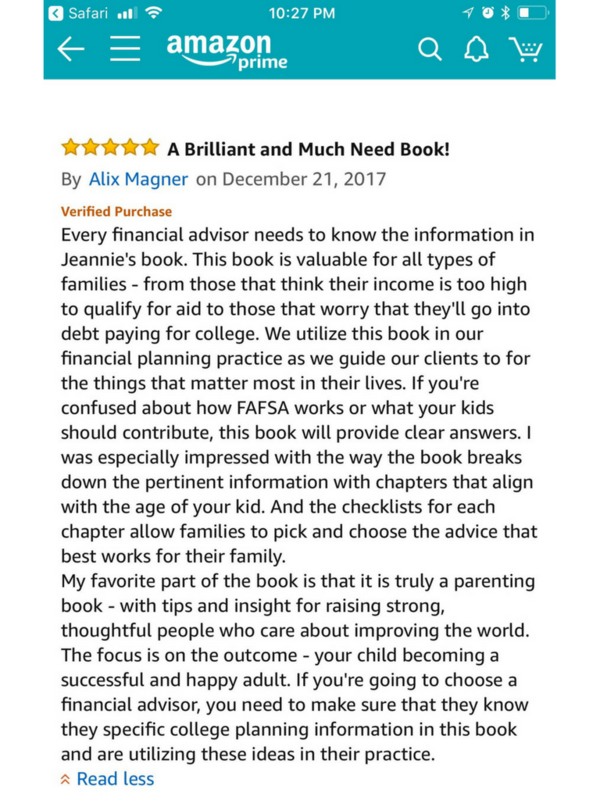 In chapter 13 I’ll help your family to use three well-respected assessments to help your daughter figure out a great-fit career goal based on her natural interests, gifts, Myers-Briggs personality type, and top 5 human strengths based on Gallup research. If your daughter’s current college studies aren’t going to get her to an ideal-fit career after college, wouldn’t you like to know that now, before you spend $50,000 more on this college education? This is important. Tell your friends. Please read the red paragraph above. Your under-employed daughter needs chapter 13 of LAUNCH. 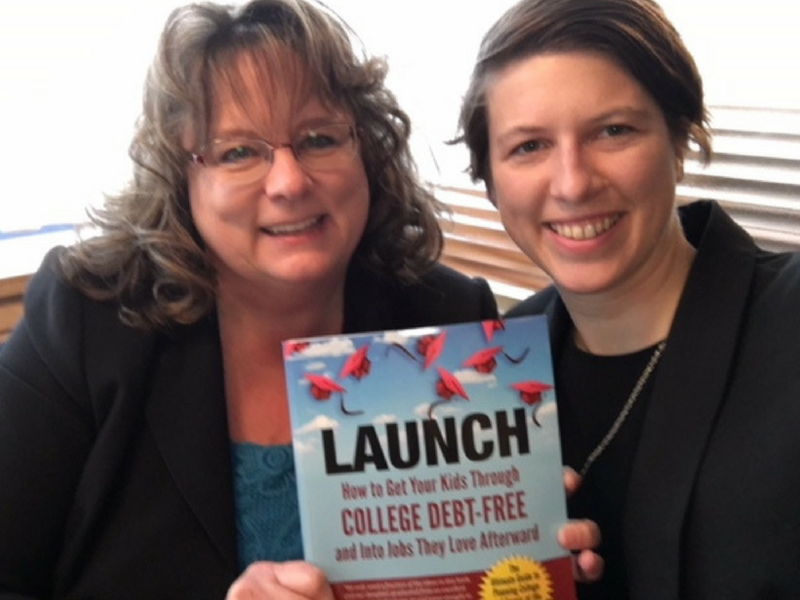 Even if your daughter is adverse to the idea of attending four-year college, she will find ideas in chapter 13 of LAUNCH that can get her to a great, well-paying career she loves without four-year college. Yes. Hundreds of ideas beyond just that. Trust me. 5. I already have so many books I’m supposed to be reading. I’ll read those first, and then get to this one later. Wait, wait — this isn’t a book you read straight through. LAUNCH is set up so you read only 1-2 chapters every three months or so while your kids are in middle school and high school. Chapters are carefully labeled so that you always know exactly which chapter you should be reading when. This way you never feel overwhelmed, but you always learn about all the best debt-free college and career strategies at exactly the right time to implement them. The last thing you want is to find yourself, when your son is a junior, slapping your forehead and saying, “I’d give anything if I’d have just known about this sooner!” The best advice? Get LAUNCH when your child’s just starting middle school, and read it bit by bit over five or six years. I have carefully planned for this. You’ll subscribe to my free weekly email newsletter using the form on this site, and then carefully whitelist it with your email provider so it always shows up in your primary email inbox. Anytime anything changes, I’ll be able to update you instantly. Yes. Pages 161-165 explain exactly what co-op college programs are, how they can help students get stunning amounts of real-world work experience while they’re still in college, and what spectacular tax advantages co-op college programs have for parents. LAUNCH also provides a list of 67 colleges and universities that have co-op college programs, so you can save yourself days of googling. I travel all over the United States for speaking. I love meeting your people, and I love answering individual questions for them after I speak. And the best news? Parents willingly pay extra to hear me, so no matter what kind of event you’re planning, you will likely make money by having me in your lineup. The first step to getting me to speak is having a phone conversation with me where I hear about your organization’s needs and create a plan tailored specifically for you. Check out what parents and students are saying about my speaking (and give a listen to what I sound like) at JeannieBurlowski.com/SPEAKING, and then email my assistant, Natalie, at Jeannie@JeannieBurlowski.com to set up your free no-obligation planning phone call. 9. I’m a grandparent. Can I use this book to help my grandchildren? Yes! Oh, what a valuable gift you’ll be giving them if you do this. Chapter 3 of LAUNCH even includes two special things you as a grandparent can do to start amassing college savings for kids right now, without spending one penny more than you are already. Your grandkids’ parents are so busy — if you step in and provide just a little help with debt-free college prep steps now, that could end up being a blessing to your family in ways that last for generations. Click here to get your copy of LAUNCH. You can see LAUNCH’s reviews on Amazon by clicking here. Do you already have your copy of LAUNCH? If so, please help me by writing a thoughtful, honest review of it on Amazon, here. What strategies are you planning to use to get your kids through college debt-free and into great jobs afterward? Comment below or LIKE Jeannie Burlowski Author on Facebook, find this post on that page, and let’s talk about it there.